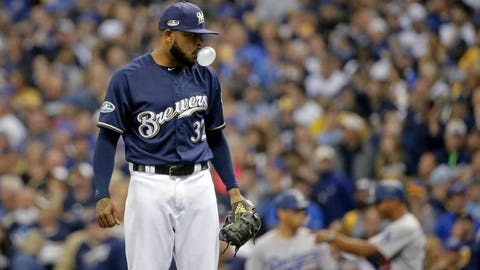 The Milwaukee Brewers made a flurry of moves to tweak their pitching staff Tuesday afternoon, reinstating reliever Jeremy Jeffress from the 10-day injured list and placing Freddy Peralta on the 10-day injured list with an SC joint injury. Milwaukee also recalled right-hander Aaron Wilkerson from Triple-A San Antonio and optioned right-hander Jake Petricka to Class-A Wisconsin. Jeffress began the season on the injured list after suffering a setback on his injured shoulder in spring training. He’ll make his 2019 MLB debut with high expectations, trying to follow up a career year in 2018 that saw him tally a 1.29 ERA, 10.4 K/9 and be named to his first All-Star game. In his rehab stint with Triple-A San Antonio, Jeffress allowed seven runs on nine hits in 4 1/3 innings over four appearances. Jeffress joins a Milwaukee bullpen that owns a 4.43 ERA, which ranks eighth in the National League. Peralta has made four starts for the Brewers this season with mixed results. He held Cincinnati scoreless through eight innings on April 3, but in the other three starts, the 22-year-old allowed 14 earned runs in 9 2/3 innings. Wilkerson made three appearances for Milwaukee last season (one start) and allowed 10 runs in nine innings. Petricka has yielded two earned runs on two hits in two innings of work for the Brewers this season.